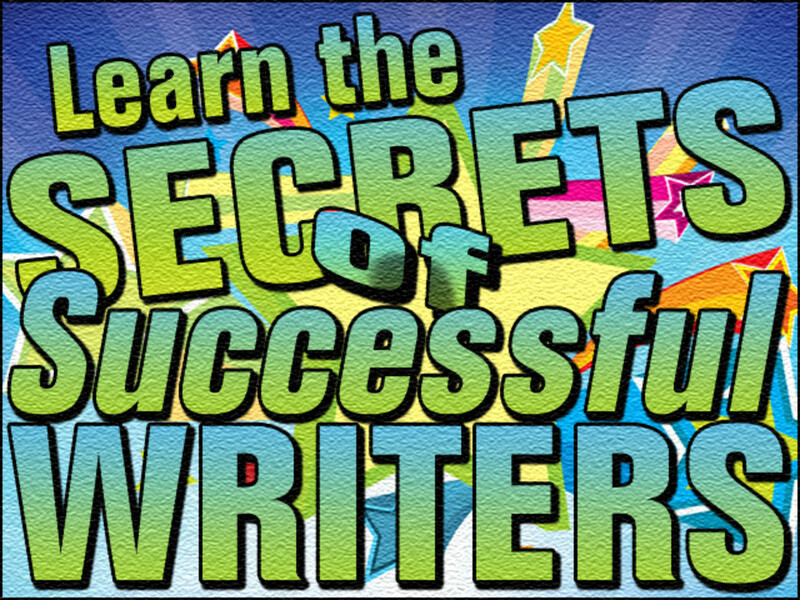 Learn the secrets of successful writers! Get ready to write like a pro! Learn how to write concisely, clearly, and meaningfully — With quotes from famous writers, best-selling authors, and the world's most influential thought leaders of past and present, I will reveal some of the most important techniques to write in plain English—the preferred writing style that professional and successful business writers and journalists use. 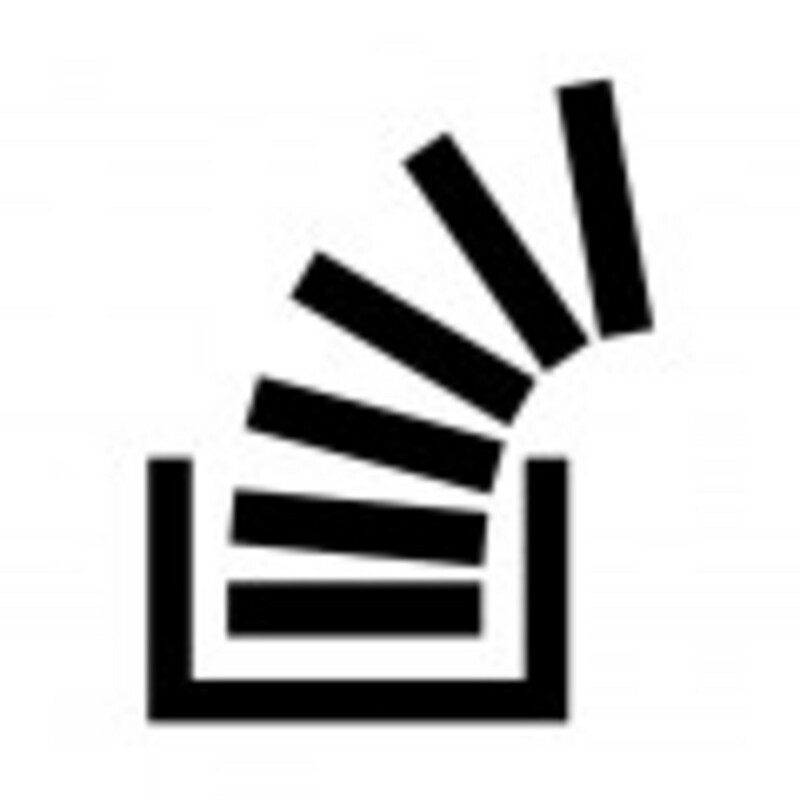 Adapting to a plain English writing style improves the likelihood that the average reader will understand your content the first time he or she reads it. Plain English means using: 1) common, ordinary words; 2) brief, yet clear and compact sentences; and 3) a coherent and harmonious arrangement of paragraphing. Plain English writing does not mean shortening everything you write. Instead, it pushes you to write in a style that is direct, clear and accurate. This style of writing does not mean that you must always use simple words instead of longer, more accurate (and appropriate) words; nor does this writing style force you to remove technical information to produce reader-friendly prose. Occasionally it is important to use technical information in your writing, but the rules of plain English writing will guarantee that your readers can access and understand your information without difficulties. 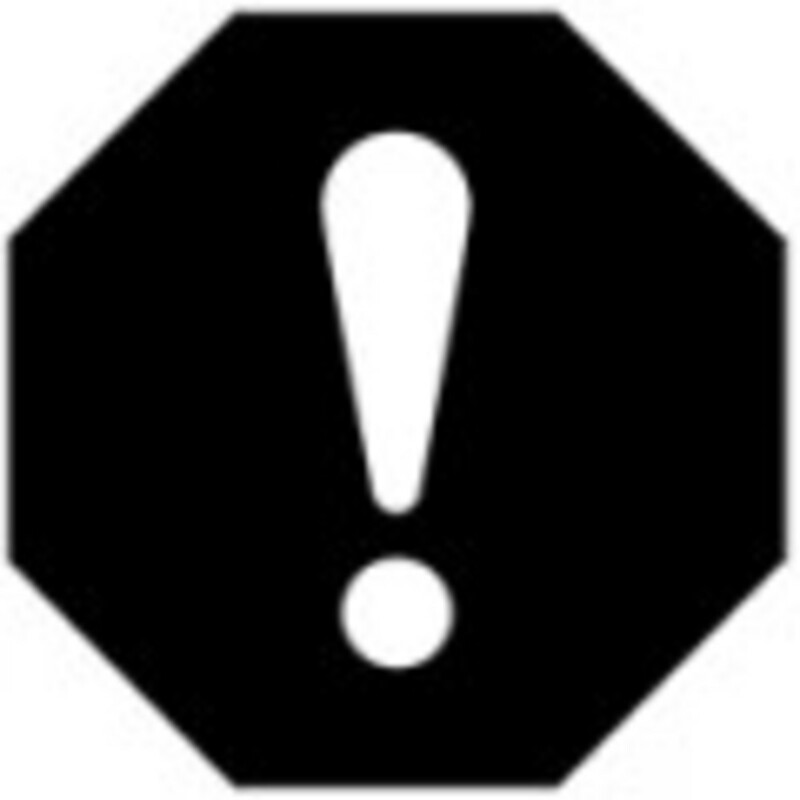 If you find my Hub useful, please "Like it" and share it with your friends and colleagues. Also, please BOOKMARK this webpage for easy reference. This webpage is copyrighted. 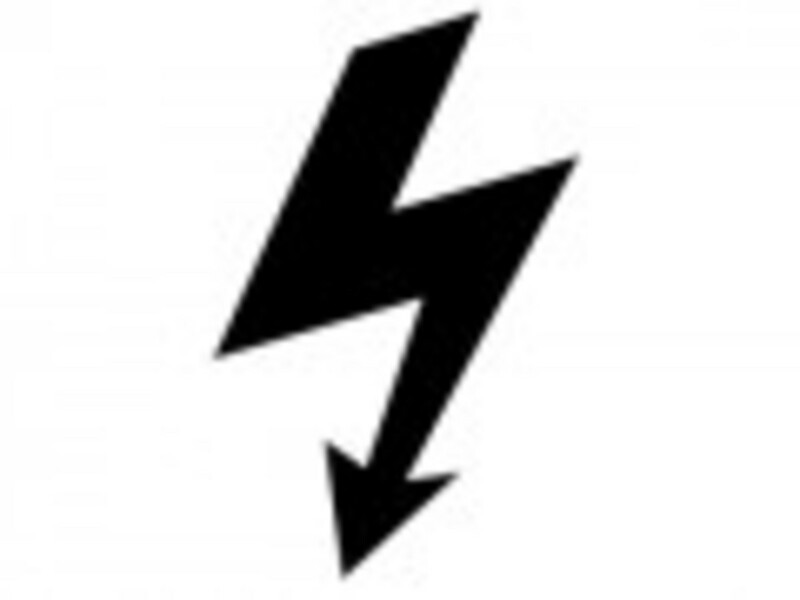 All content on this webpage is protected by United States copyright laws and may not be reproduced, distributed, transmitted, displayed, published or broadcast elsewhere without written permission from me. William Carlos Williams (Sept. 1883 - Mar. 1963) was an American poet connected with modernism and Imagism. He was posthumously awarded the Pulitzer Prize for Pictures from "Brueghel and Other Poems." 1) What am I writing? 2) What is my purpose for writing it? 3) Who is my audience? My primary reader? 4) What important facts do I need to make? 5) What is the overall message that I want the reader to understand? 6) How is the reader most likely to react to my message? 7) What action, if any, do I want the reader to make at the end? 8) Do my readers have any special handicaps, such as cultural differences, language barriers, or a below average education level? 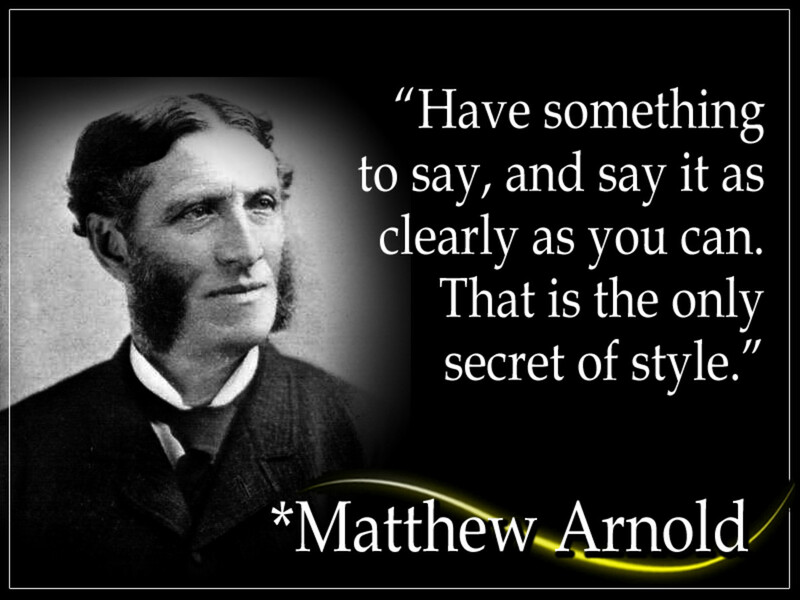 Matthew Arnold (1822 - 1888) was a British poet and social critic. He is sometimes referred to as the "third great Victorian poet." He coined the phrase "New Journalism," which now defines the complete category of newspaper history. Have something to say—and think it through. 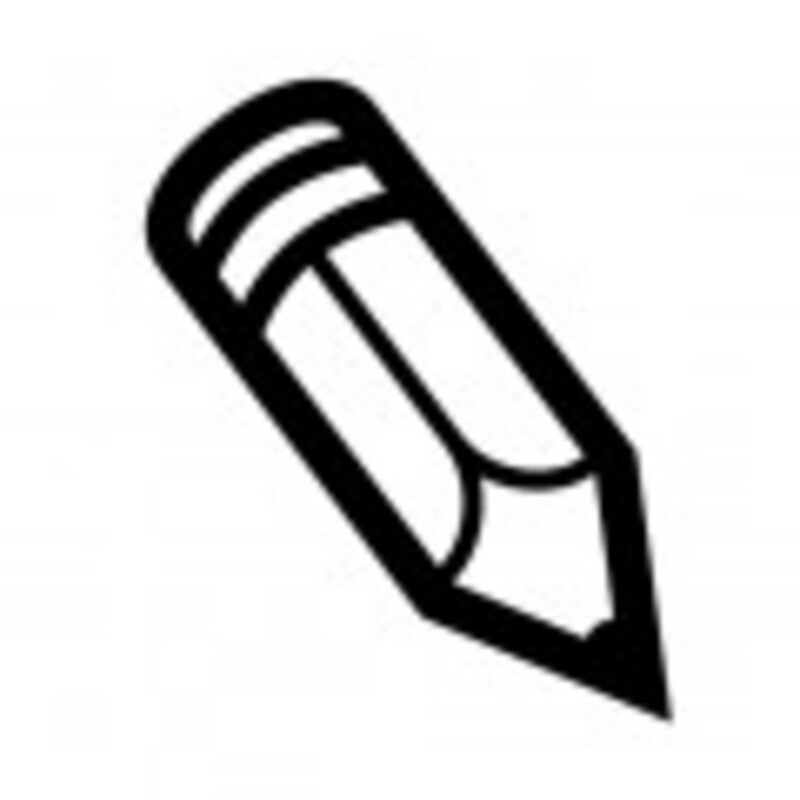 Writing flows more effortlessly if you have something to say. The common challenge in writing is to convey an idea. To accomplish this—and to communicate clearly—you must: 1) have something to say; 2) you must have readers to express it to; 3) you must arrange and plan what you want to say; 4) you must map out the order in which to say it; and 5) you must write it and rewrite it. 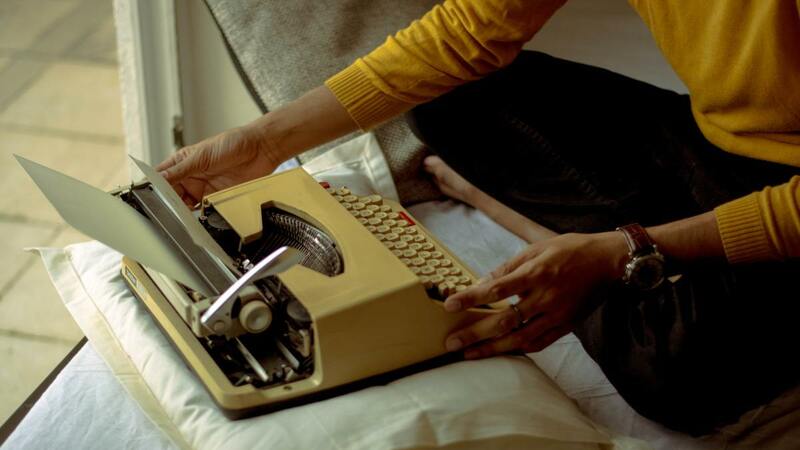 To have something to say is—without a doubt—the life-support of all good writing. 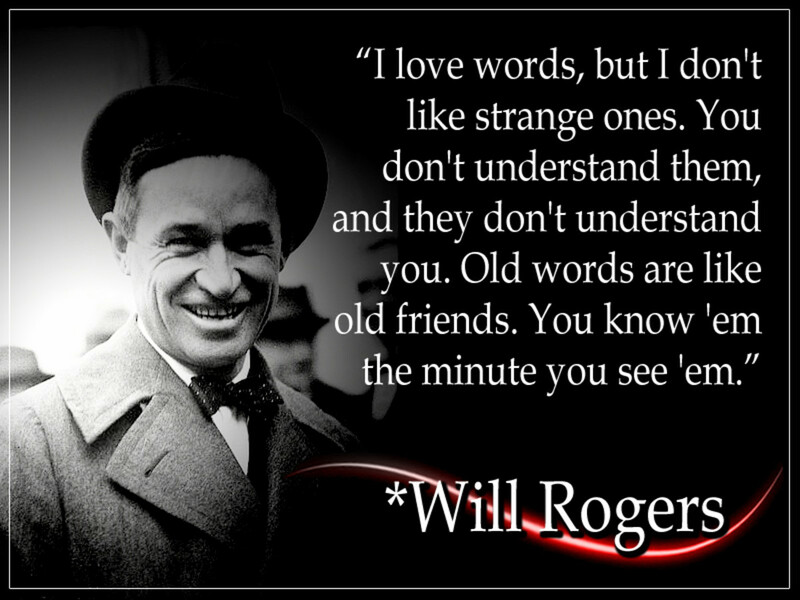 Will Rogers (Nov. 1879 - Aug. 1935) was one of the world's most popular celebrities in the 1920s and 1930s. He circumnavigated the world three times, performed in 71 movies, and composed over 4,000 nationally-syndicated newspaper columns. Plain English demands that we use comfortable, common (everyday) words. They are the vehicles of communication. Words must sound proper to us and to our readers. In fact, they must sound more useful to us than big words do. All good writing demands us not to disrupt what we are striving to communicate. When we refer to "everyday words," we mean common, conversational words. It does differ from trade to trade, from industry to industry. A horticulturist's everyday word could perplex a scientist. But we aren't speaking about the "shoptalk" used by professionals. We're speaking about words that we put forth when writing to the layperson. Everyday words are the common words that we all comprehend without struggle because they're the words that we use in our own thought-process. 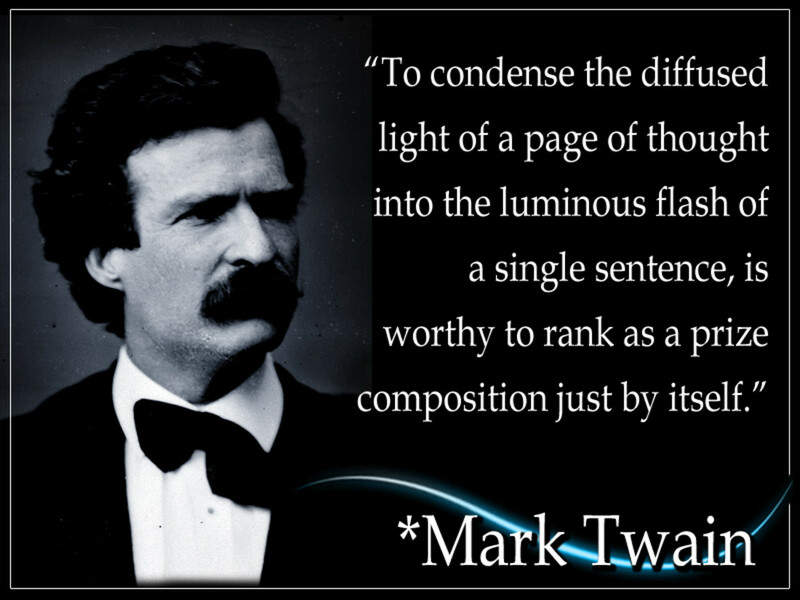 Samuel Langhorne Clemens, better known as Mark Twain, was an American writer and satirist. He is most remembered for his great American novels, "The Adventures of Tom Sawyer (1876)," and its follow up, "Adventures of Huckleberry Finn (1885)." Rule # 4: Use the Right Word! USE THE RIGHT WORD: We have many troublesome words in the English language. 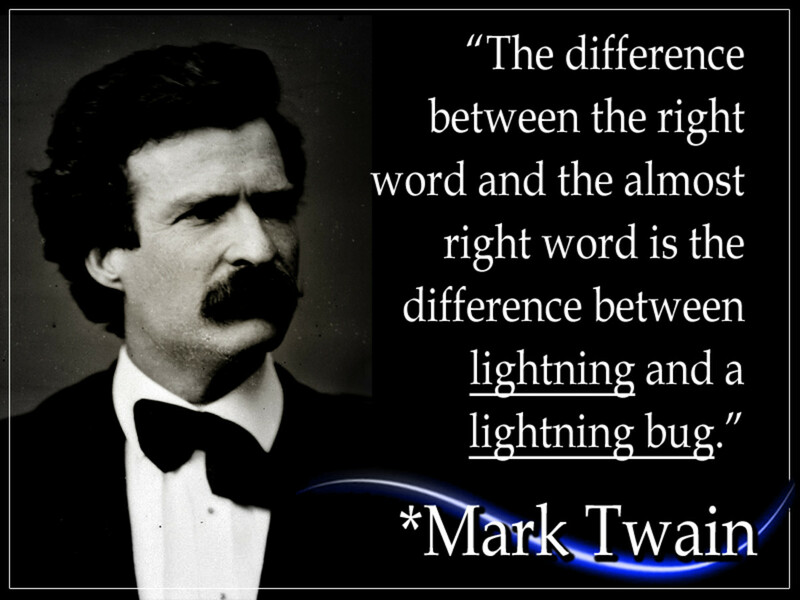 Using the right words, particularly in business writing, reveals the skill-set of the writer. You must choose the right words in the right situations, allowing for every plausible way that your readers might interpret them. You must know—very clearly—what you need to achieve in your writing before you breathe life into the very first word. An unfocused mind produces unfocused writing. 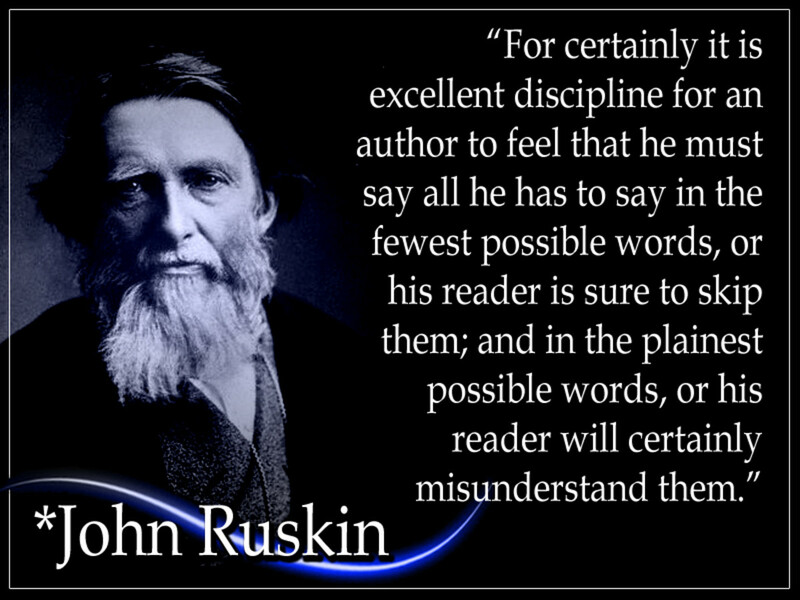 John Ruskin was the foremost English art critic of the Victorian era. His fancy ornate writing style that categorized his earliest writing was later supplanted by a desire for plainer language to convey his ideas more efficiently and effectively. 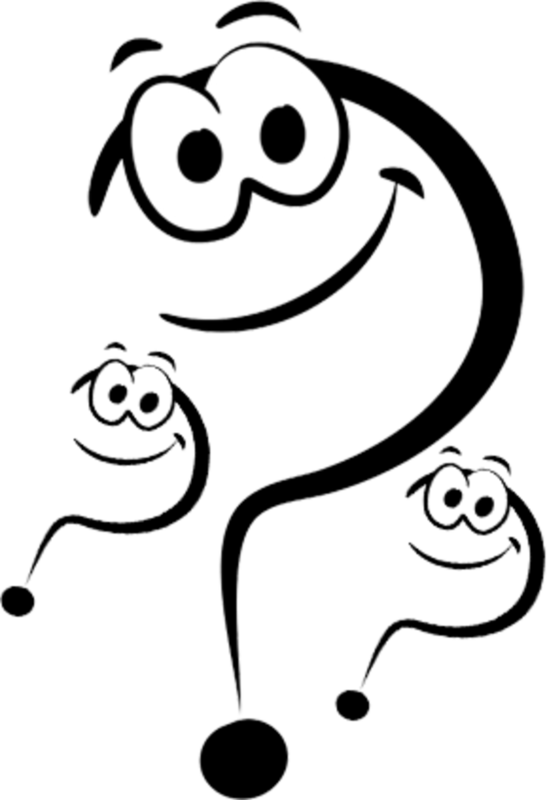 Complexity is one of the primary smog factors that plagues poor writing. Complexity is predominantly, but not solely, a mechanical mess. It arises from not maintaining the relationship and logical flow between words, phrases, and clauses. It usually arises when we cram excessive facts and ideas into one sentence or when we string together too many related ideas and descriptive words. Remember to keep your writing simple. 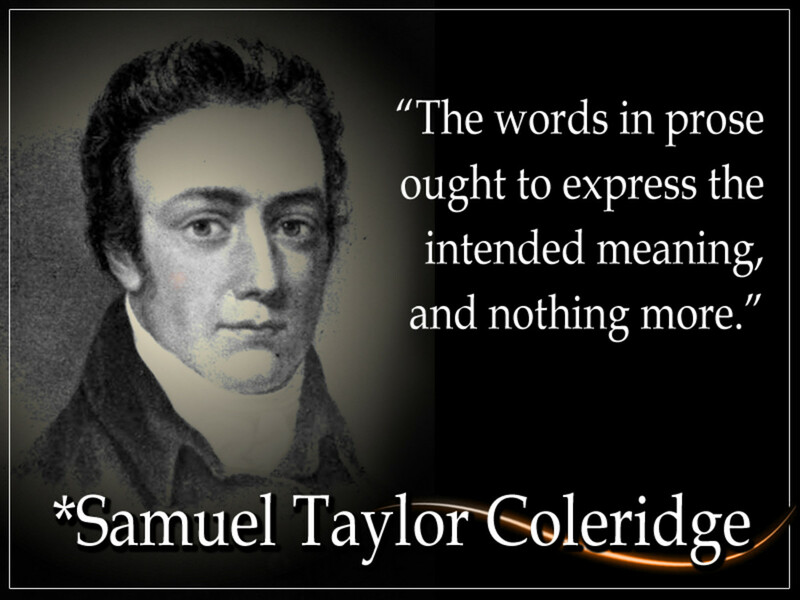 Samuel Taylor Coleridge (October 1772 - July 1834 ) was an English transcendental poet, dramatist, fictional reviewer and philosopher. He originated many familiar words and expressions, including the well-known "suspension of disbelief." Rule # 6: Convey Your Intended Meaning to Your Intended Audience! WRITE WITH PURPOSE: Write to convey your message, not to impress your readers. Do not write flowery prose or technical jargon unless you are specifically writing for that audience. Adapt your writing style based on your audience and their reading/education level. Legalese and government gobbledygook often confuse average readers, and even to some experts. Favor common, clear, everyday words to convey your message. 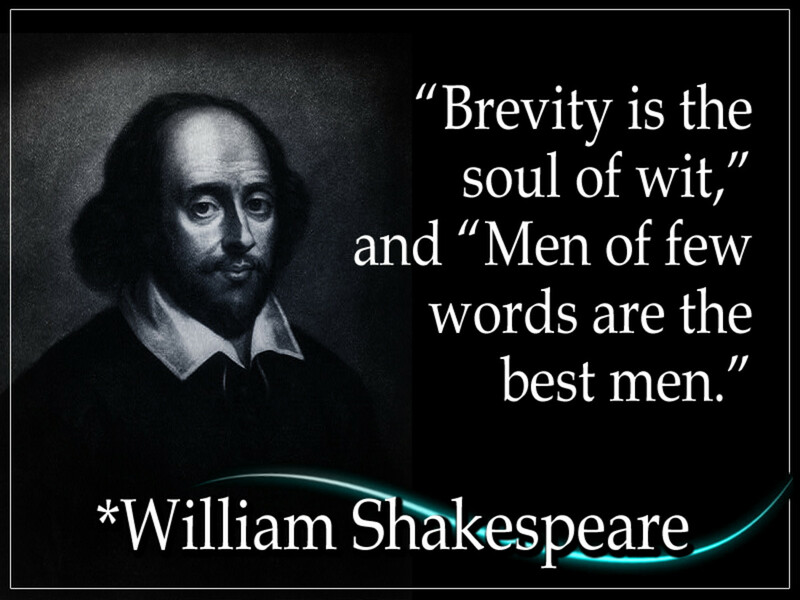 William Shakespeare was an English poet and dramatist, viewed as the foremost writer in the English language and the world's transcendent playwright. His works include 38 plays, 154 sonnets, and several poems. Rule # 7: Use as Few Words as Possible! Use lively words (strong verbs!) 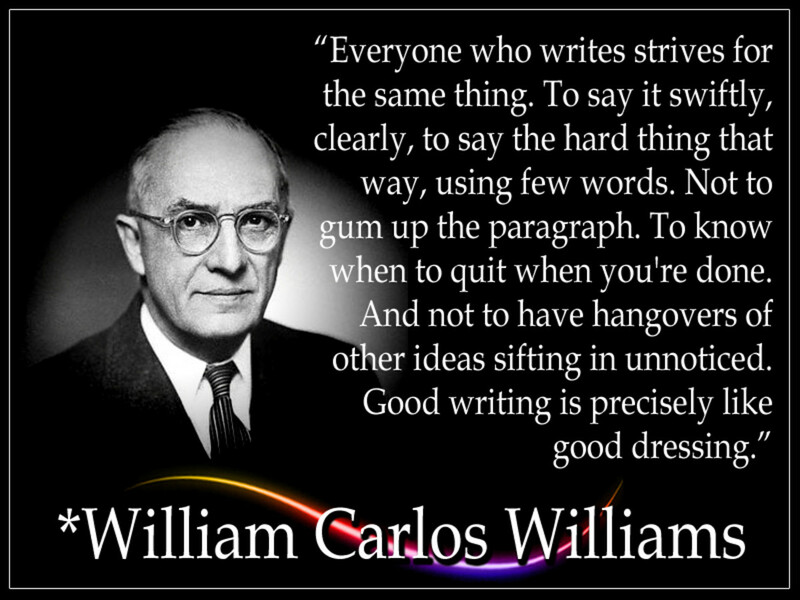 to enrich your writing. Readers benefit from simple, direct, lively language. Writing sentences in active voice is more succinct and forceful than sentences in passive voice. Strong, direct verbs help the reader know who is performing the action and what is being acted upon. You can find "weak verbs" in your writing by identifying passive voice and hidden verbs. Weak verbs always add excessive length and confusion to a sentence. 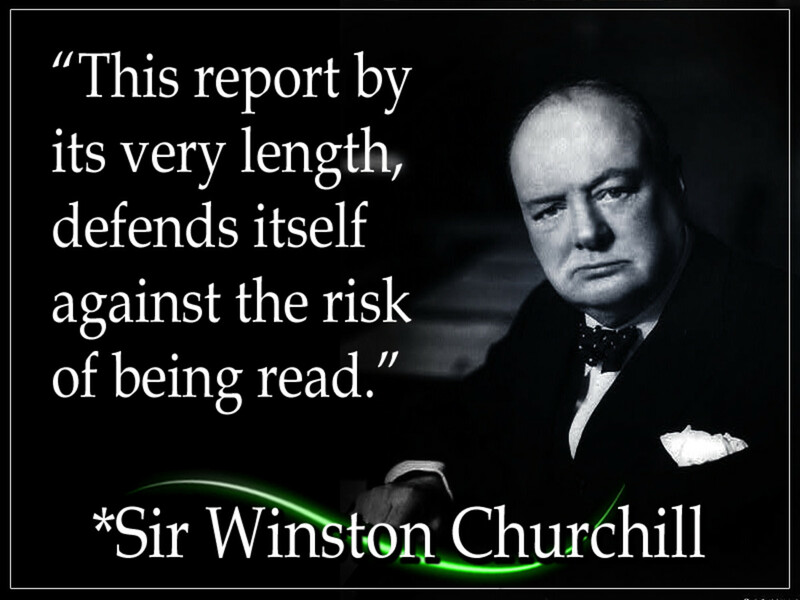 Sir Winston Churchill (November 1874-- January 1965) was a British Right-wing political leader and senator recognized for his leadership of the United Kingdom during WWII. He is the only British chancellor to be awarded the Nobel Prize in Literature. 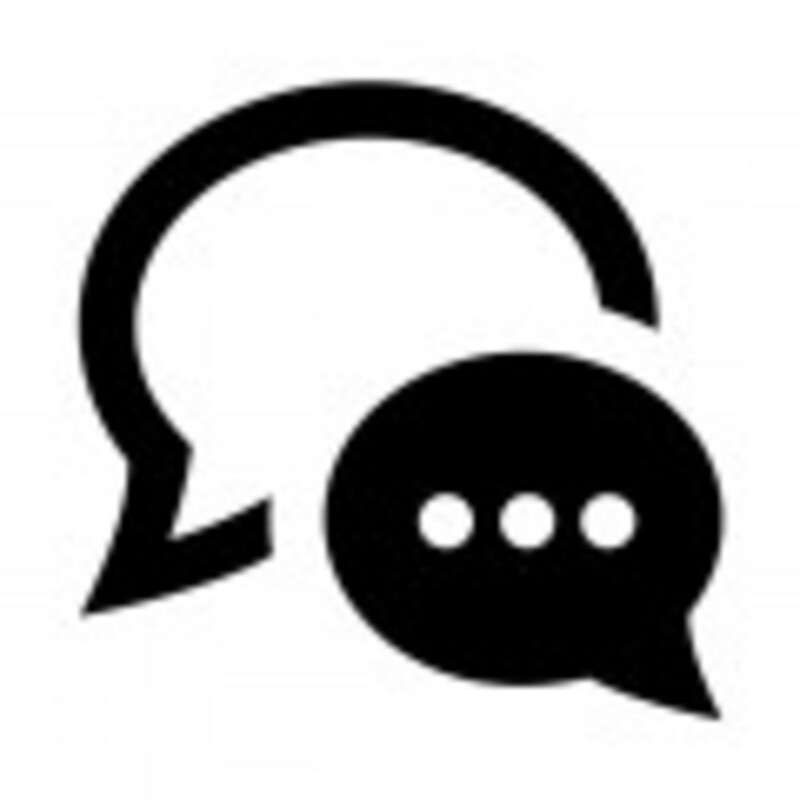 Rule # 8: Avoid Verbosity! Reduce compound prepositions. A compound preposition is two or more words. The words "next to," "in between" and "because of" are prepositions comprised of two words; "in spite of," "in front of," "on behalf of" are prepositions comprised up of three words. Keep your message simple by using its plain English counterpart. For example, rather than using the word "disseminate," you could use a simpler equivalent, such as "spread." 1) Use "how" instead of "the manner in which." 2) Use "then" for "at that point in time." 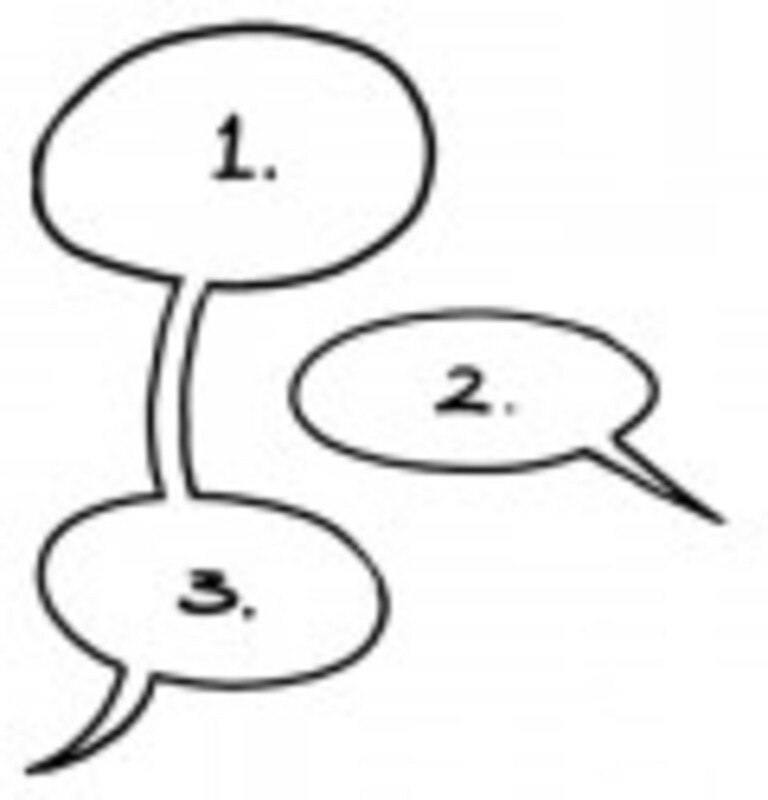 3) Use "from" for "from the point of view of." 4) Use "for" instead of "for the purpose of." 5) Use "although" for "despite the fact that." 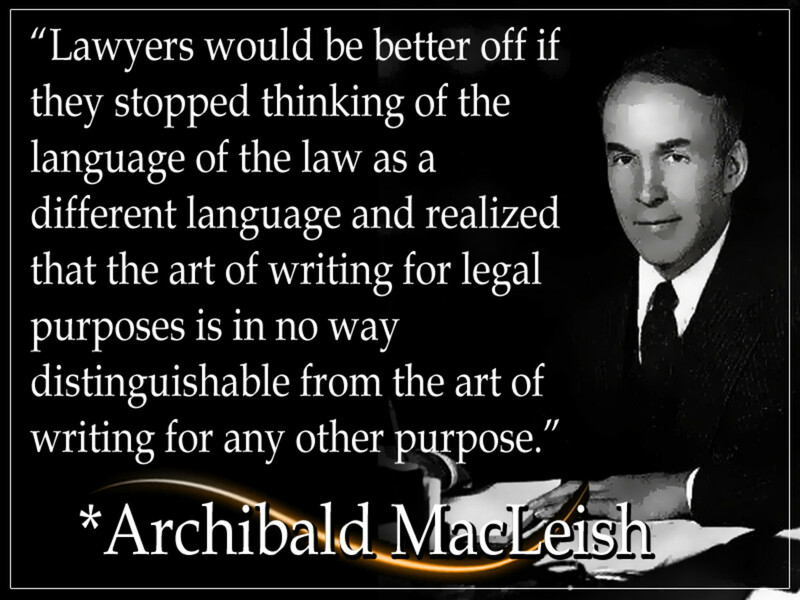 Archibald MacLeish (May 1892 - April 1982) was an American author, writer, and the Librarian of Congress. He is affiliated with the Modernist philosophy of poetry. He was awarded three Pulitzer Prizes for his work. Avoid these "deadwood" words that weigh down good writing: henceforth, hereby, hereinafter, herewith, heretofore, therein, wherein, and dozens of other outdated words that plague and sicken legalese and government writing. Just because Shakespeare used these words fruitfully in his works (and sadly, so do many lawyers to this day), does not make it acceptable for modern writers to use them. They are stale, outdated, too distracting, and drip of "officialness." Also omit permanently the word "shall" from your vocabulary because it forces the reader to interpret one of its five meanings. Good writing demands that we choose practical, useful words. The words we pick either reveal or hide our meaning. When your writing style is engaging and lively, the reader feels as if your are writing directly to him as a person. When we write simply and succinctly, we avoid distractions and intrusions—only our ideas are noticeable, and they are crystal clear to the reader on his first reading. Attaining such a style starts when you pick direct, uncomplicated words. Always write based on your audience's perspective and their level of reading comprehension (which, for the general public, is between a 7th and 9th grade reading level). 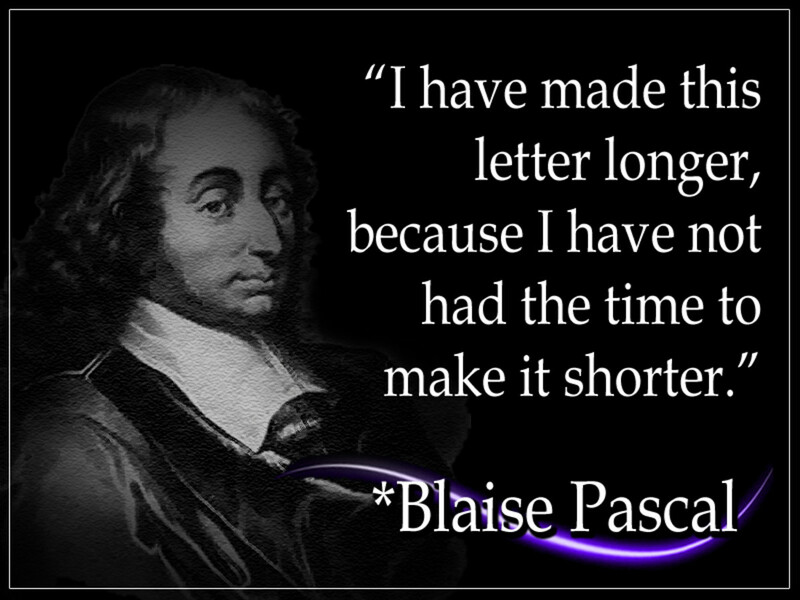 Blaise Pascal was a 17th-century French math wizard, scientist, pioneer, writer and Catholic theorist. Construct your sentences with excitement and enjoyment. Your selection of words, the tempo of the clauses, and the sounds of the words all add a positive reading experience. You should read your work out loud and hear your voice on the page. Ensure that each sentence performs a job. Eliminate verbal noise, clutter, and unneeded vocabulary. 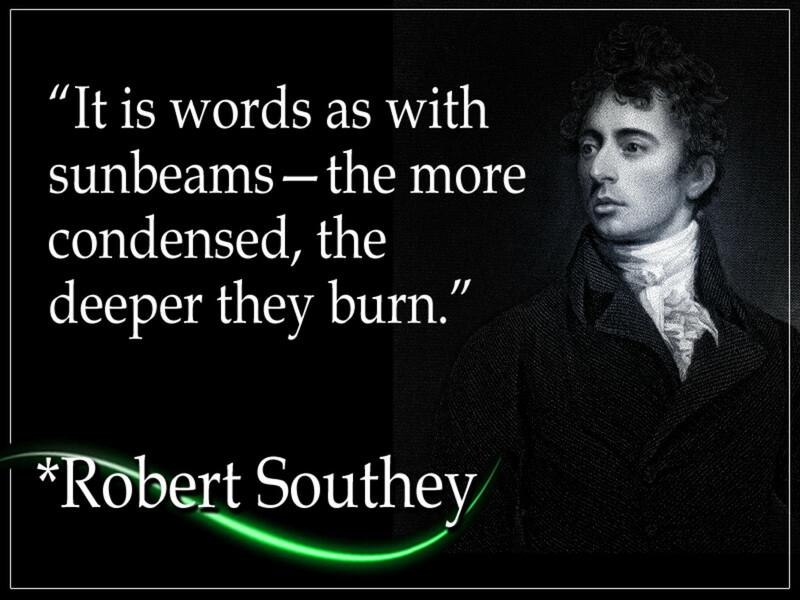 Robert-Southey was a 17th century English poet of the Romantic period, and Poet Laureate for 30 yrs.Southey was a productive correspondence writer, literary professor, exposition writer, historiographer and storyteller. Use both specific words and concrete words instead of abstract words. Readers can grasp specific words faster and easier because they are well-defined. Concrete words label real things and real people, and also appeal to a reader's five senses: his eyes, ears, taste, touch, and smell. These concrete words are the bowels of all good writing; they are as common to a reader's mind as wet is to rainwater, air to lungs, heat to fire, light to candle, and odor to sewage. Ernest Hemingway was an American author and writer. His minimized writing style had a substantial impact on 20th-century fiction. He authored 7 novels, 6 short story anthologies, and 2 non-fiction works. He won the Nobel Prize in Literature in 1954. 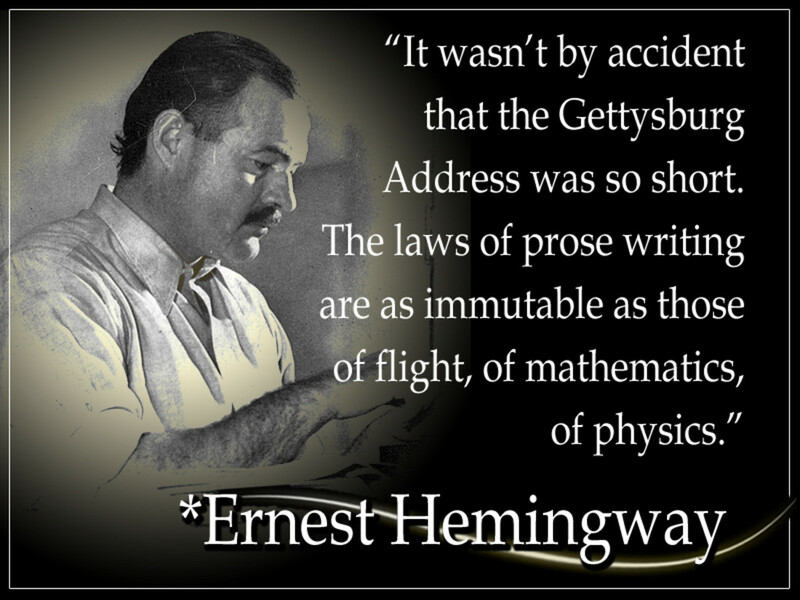 Ernest Hemingway's writing style is one of the most familiar and dominant literary styles of the 20th century. Many reviewers consider his style as being more "conversational" than ornate—a skill he honed from working as a newspaper reporter where tight deadlines forced him to write short sentences and lively English. Hemingway's style is straightforward, with basic grammar encased in simple language that everyone knows. His trademark is an uncluttered style that shuns adjectives and employs short, balanced sentences that focus on action instead of pensiveness. The vague notion that his style is "simple" and "uninteresting" is inaccurate. He simplified his writing style, even though he knew all of the big words in the dictionary and all of the rules of rhetoric. 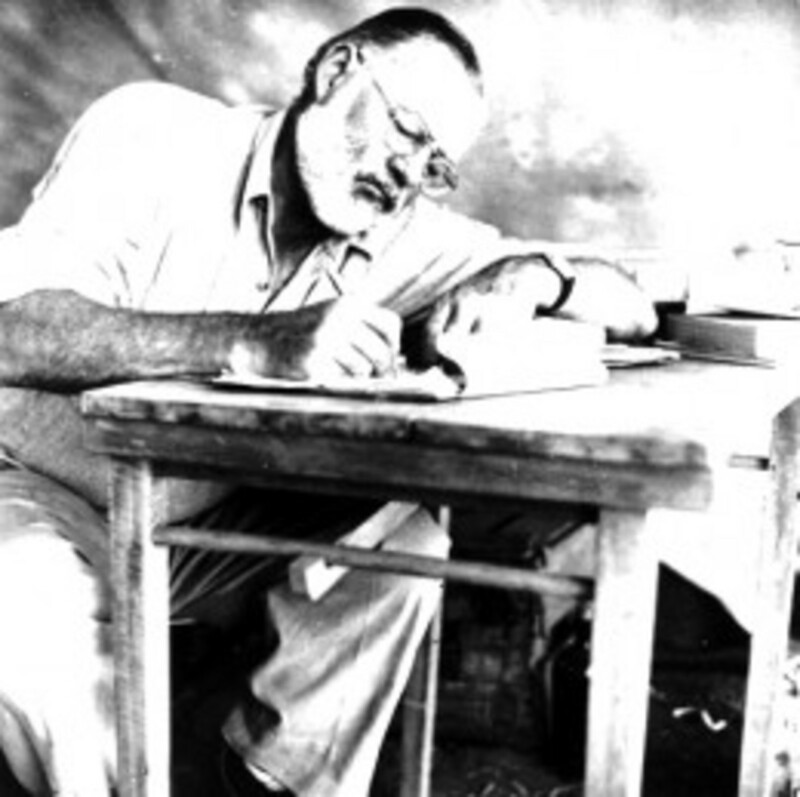 Hemingway was also known as a compulsive reviser and editor. His books are best-sellers because he carefully selected only those ingredients belonging to the story and trimmed or omitted everything else. He made his writing lively, sincere, and forthright. 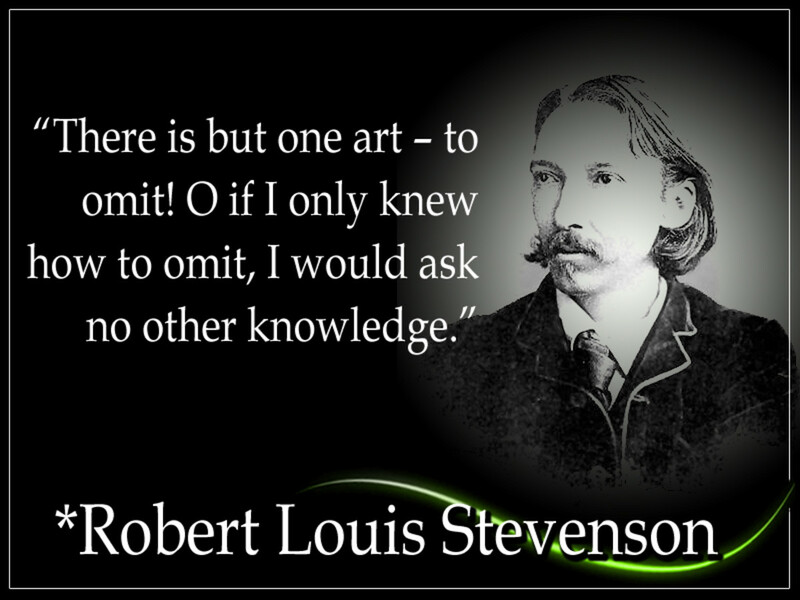 Robert Louis Stevenson (Nov. 1850 - Dec. 1894) was a Scottish fictionist, author, and travel writer. His most acclaimed works include "Treasure Island" and the "Strange Case of Dr Jekyll and Mr Hyde." He is one of the most translated authors. When you edit your writing, highlight all abstract words and replace them with specific or concrete words. Abstract words, similar to basic words, are so wide-ranging, so vast, and so full of various meanings that an unskilled writer can make them mean almost anything. Also, similar to general words, abstract words have different levels of abstraction—and the greater the level, the more difficult it is for the reader to uncover the true meaning. 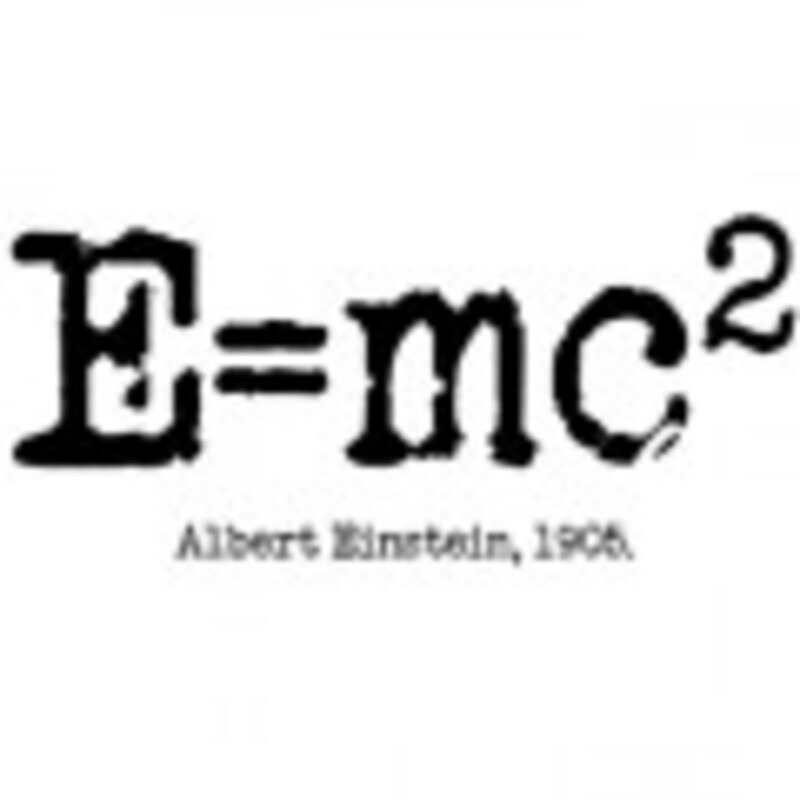 Albert Einstein was a German-born ideational physicist who created the general theory of relativity. Einstein is often called "the father of modern physics." He published over 300 scientific papers and over 150 non-scientific works. 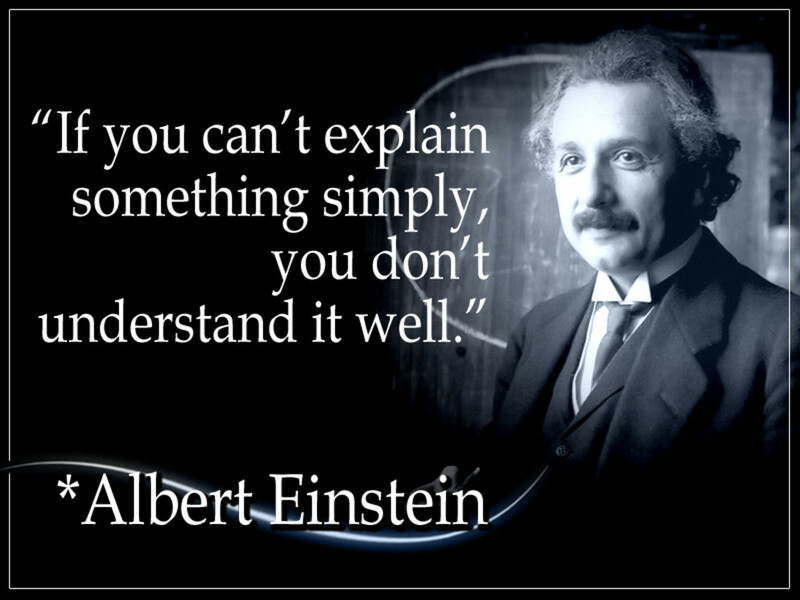 Not only did Einstein write 300 scientific papers and over 150 non-scientific works, he also had to simplify most of them so other scientists, inventors, and the general public could understand each paper's purpose, meaning and message. Einstein always kept his audience in mind, and you must too. Maintain a balance of not writing "down" or "up" to your readers; instead, visualize how your readers will interpret your words. Read your final piece of writing as if you are a stranger to it, rewriting anything awkward, refining and sharpening every sentence, and trimming waste. Ideally, ask a colleague or a co-worker to peruse your final draft before publishing it. Be certain your message is straightforward yet that you are sincere to its complexity. 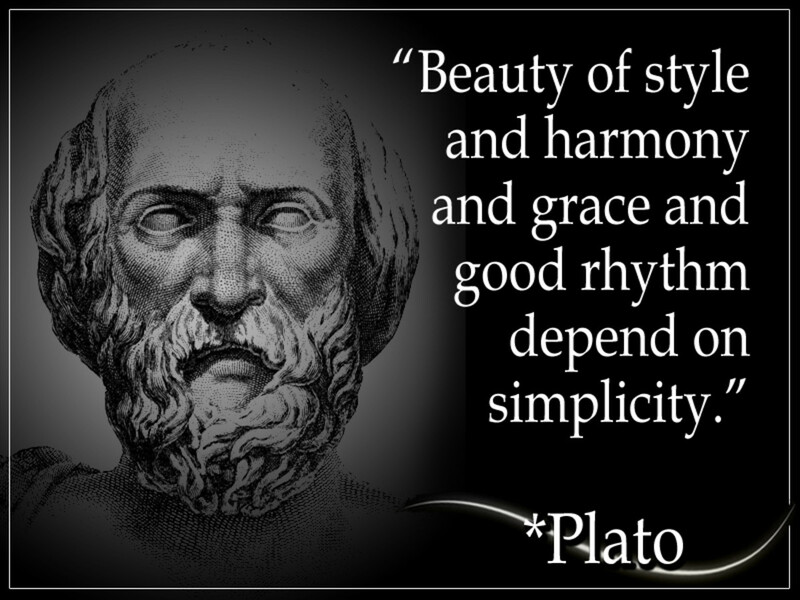 Plato was a Classical Greek theorist, logician, mathematician, and creator of philosophical dialogues. Plato's dialogues have been used to teach a gamut of subjects, including philosophy, ethical values, speech, and math. We can avoid redundancy by analyzing a phrase and extracting what it truly means. If we were to write "We are planning the party in the month of July," we can omit "the month of." If we were to write, "We are planning in advance to call our friends," we can omit "in advance." Omitting these words still retain the exact meaning of the sentences. Let definitions do their job. Instead of writing, "Our future forecast tells us that many more people will lose their jobs," we can omit the word "future." In this sentence, "During these intervals of time, we rested," we can omit "intervals of." Writers, by nature and habit, use many wordy phrases, thinking they sound "more educated." Rather, they use too many redundant expressions that disrupt the flow of their writing and make it more difficult for readers to understand. 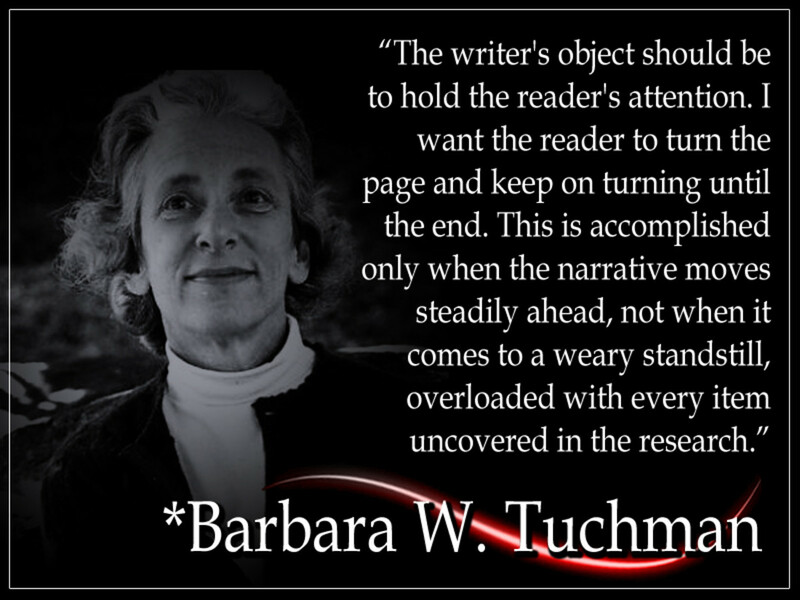 Barbara W. Tuchman Barbara Wertheim Tuchman (1912 - 1989) was an American historiographer and book author. She is the author of "The Guns of August," which won her the Pulitzer Prize for General Non-Fiction in 1963. HOLD YOUR READERS' INTERESTS: You truly must care about your subject matter, and it should interest you. Always have something to say. If the subject makes you feel detached or disinterested, your writing will be spiritless, placid and unexciting. Sometimes it is difficult to force yourself to write a memo, a resume, a cover letter or a business letter, but you must find some way to make "forced" writing enjoyable for yourself. To interest yourself is the first duty of writing; your second duty is to carry this interest to your readers. 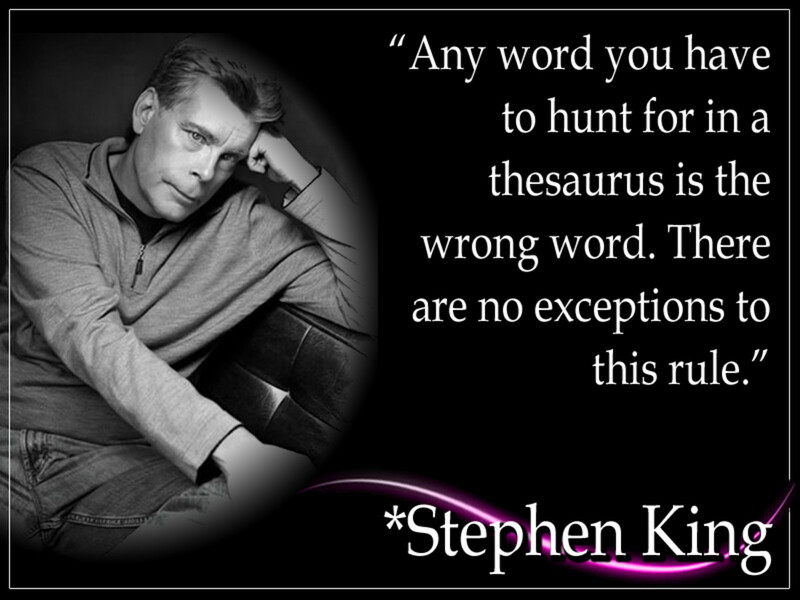 Stephen King is an American author of modern horror, suspense, sci-fi and fantasy fiction. His 49 books have sold over 350 million copies and have been made into a variety of motion pictures, tv movies and comics. When you write for a general audience, you must strive for clearness; as a result, you regularly repeat particular words and concepts. You cover your information meticulously, developing the reader's information gradually. When you write for industry trade professionals (doctors, lawyers, accountants, etc. ), you make your vocabulary succinct and specific to their knowledge; you delete all unneeded (sometimes pointless) information; you concentrate on one point and you don't repeat yourself. Such writing would confuse the general reader, but the industry trade professional will find this style appealing and fulfilling. 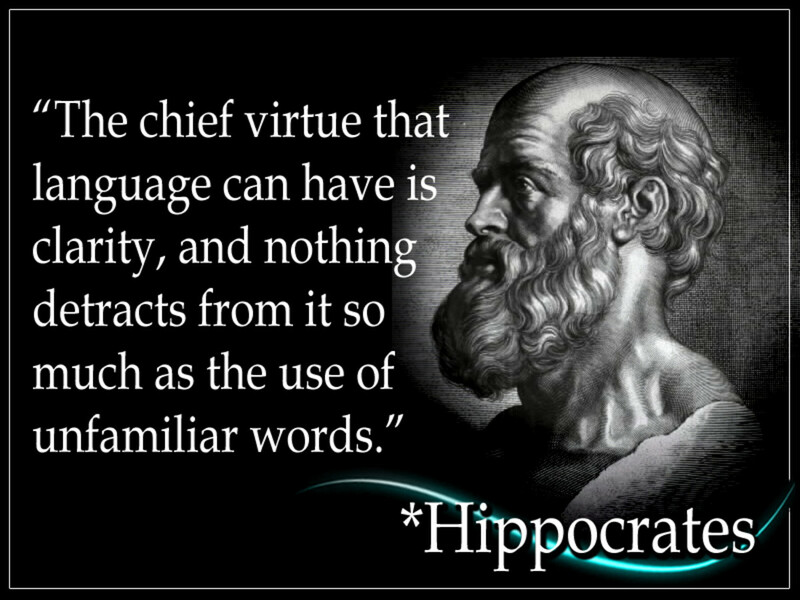 Hippocrates was an ancient Greek physician, and is considered as one of the great figures in the annals of medicine. Hippocrates is widely regarded as the "Father of Medicine." 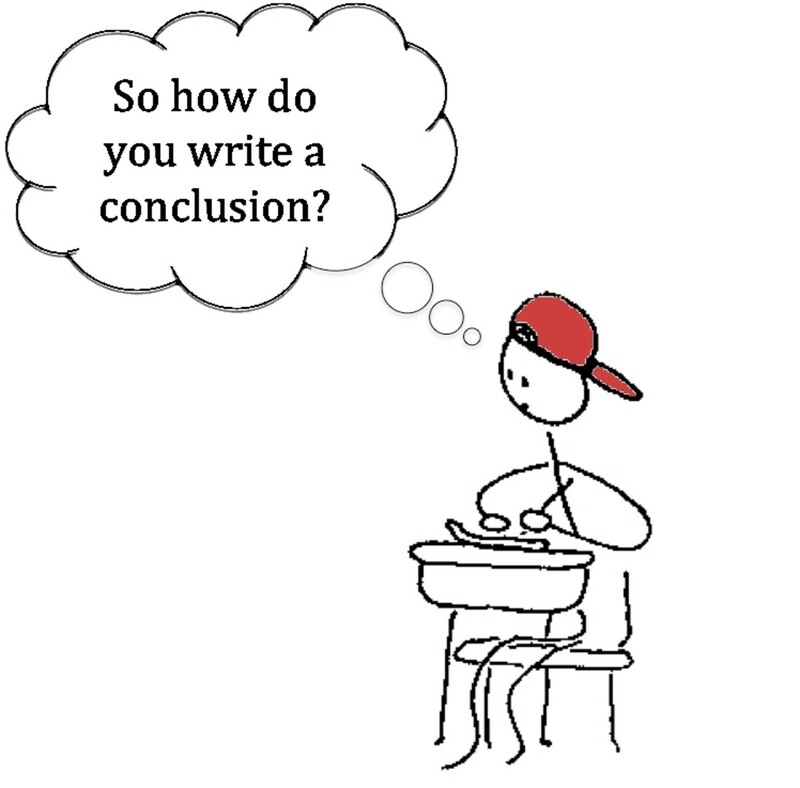 Don't become lazy in the way you write or you may wind up writing drawn-out, exhaustive explanations. When you must explain something, explain it crisply and briefly. Make it pointed and poignant. Long explanations overwork and upset readers. Delete every word that is not needed. You will minimize space and enrich your writing. When you write an argument, do not stack argument on top of argument, until you exhaust and irritate your reader. As soon as you have validated your point, stop giving extra arguments. To say anything more will perplex rather than persuade. 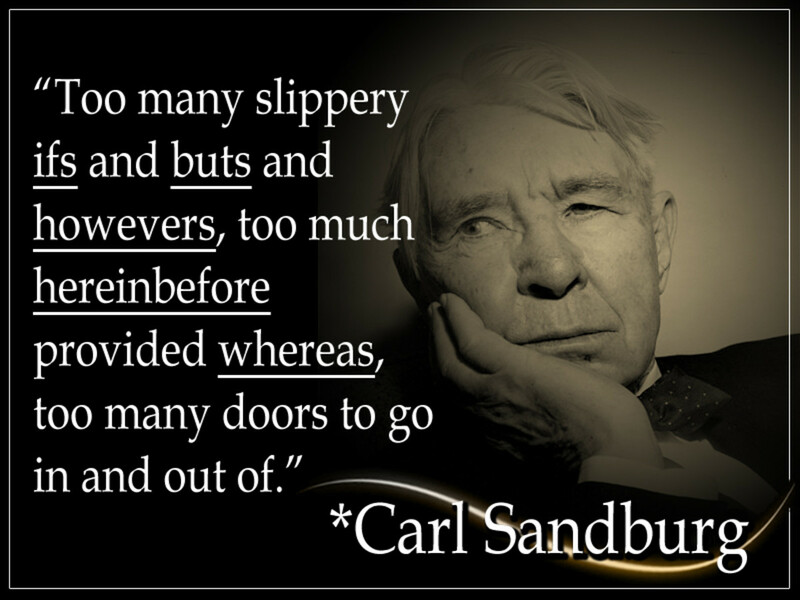 Carl Sandburg was an American writer and editor, widely recognized for his poetry. He was the beneficiary of 3 Pulitzer Prizes: two for his poetry and one for his biography of Abraham Lincoln. Plain English writing requires us to obey "unity" in our sentences and paragraphs. This means we should discuss one—and only one—idea, thought or concept per paragraph. Using one paragraph to discuss two or three points is too confusing for most readers. Of course, if you need 15 sentences to develop one idea, you are not restricted to encapsulate all 15 complete sentences into one huge paragraph. Instead, break apart long paragraphs with transitional terms, sub-headings, bullet-points, etc. Your aim is to create smaller, unified paragraphs that support the main paragraph. 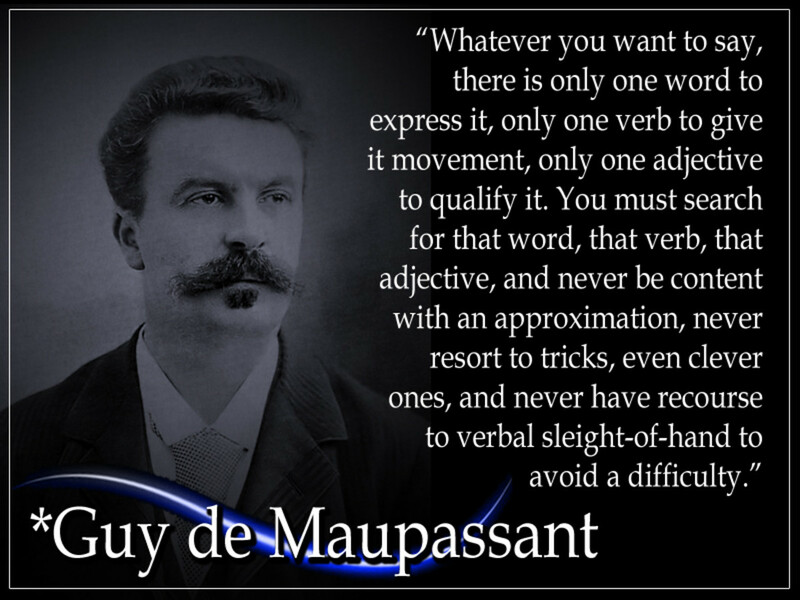 Guy de Maupassant was a prominent 19th-century French writer. He wrote 300 short stories, 6 novels, 3 travel books, and one volume of poetry. His stories are distinguished by their economy of style and efficient, simple narratives. Write short, strong sentences. The long sentence is sensible, pleasing and appealing in lots of ways, but wordy sentences nearly always disorient readers. Make your writing stylish and sharp with meaning. Then you can feel confident that you are writing clearly. When you sense that a sentence or idea might trigger confusion—that your reader might skip your point—then repeat it. Repeat your idea or point in the same words or equivalent words as many times as you believe is needed to drive your message across to the reader. To present your message clearly, say everything you must say on the subject. Say it all, in the opening paragraph, in the middle, and at the end. 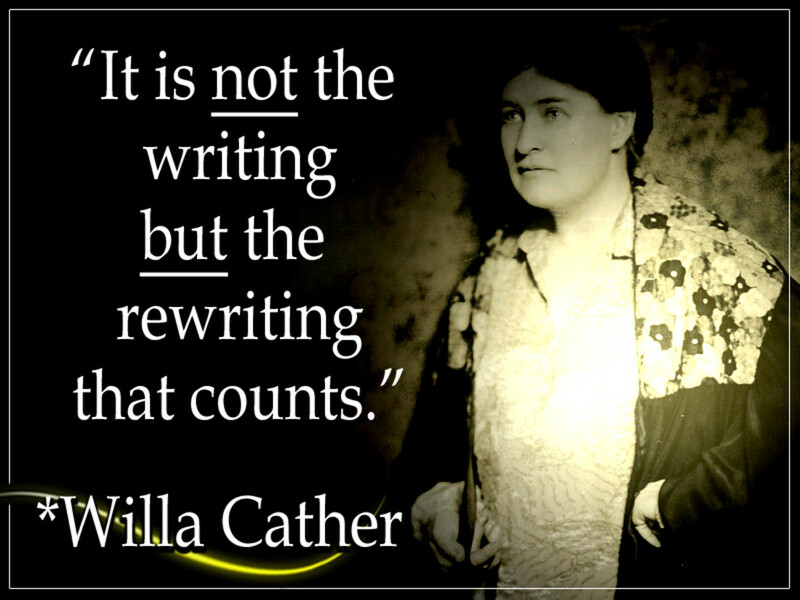 Willa Sibert Cather (Dec. 1873 – April 1947) was a Pulitzer Prize-winning American author who attained popularity for her best-sellers of backwoods life on the Great Plains. Rule # 22: Make Rewriting Count! THE REWRITING PROCESS: After you've written your first draft, you can now refine and develop it. Read it. And reread it. 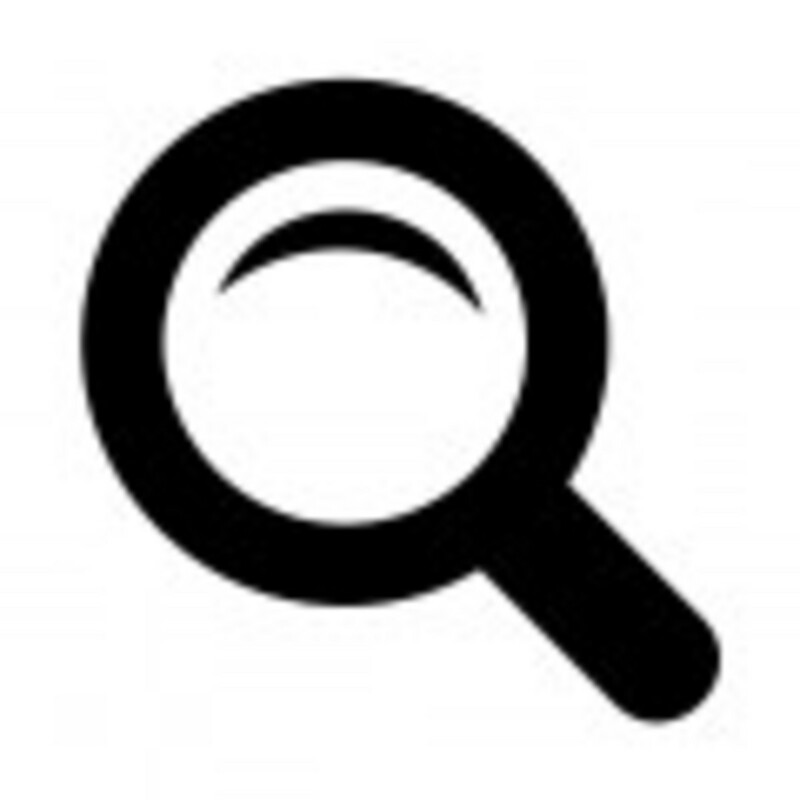 Identify "problem areas" that you can improve or omit. Yes, you are correcting grammar, spelling and punctuation—but you are also condensing sentences, shortening paragraphs, and re-arranging thoughts so your ideas flow coherently. The most successful book authors usually re-write their manuscripts multiple times. 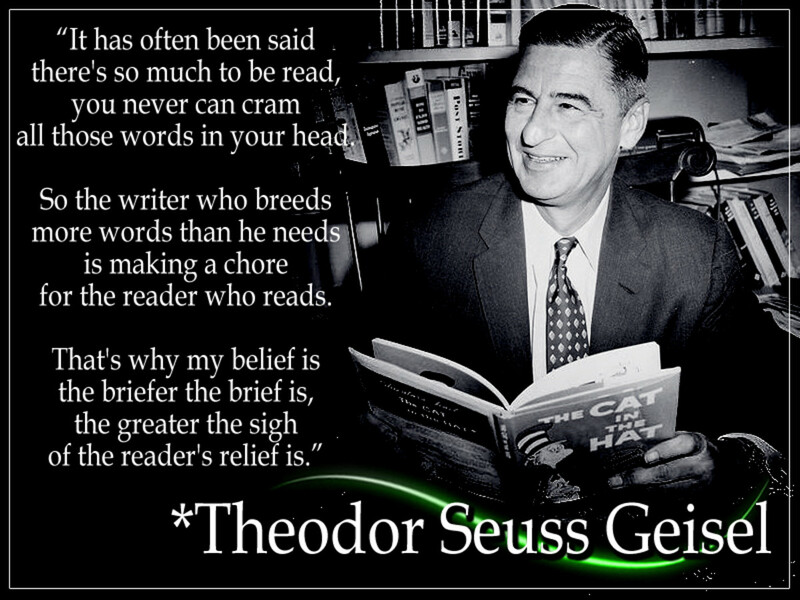 Theodor Seuss Geisel was an American author, rhymer, and caricaturist known for his children's books penned under Dr. Seuss. He published 46 children's books, incl. the best-selling kid's books, "Green Eggs and Ham" and "The Cat in the Hat." Have you ever felt exhausted after reading a Dr. Seuss book? Of course not. His children's books include lots of white space, generous margins, bold and italicized fonts, large headings, and page numbers. Instead of feeling cluttered and unappealing, his books invite our eyes onto the page with plenty of "breathing room." 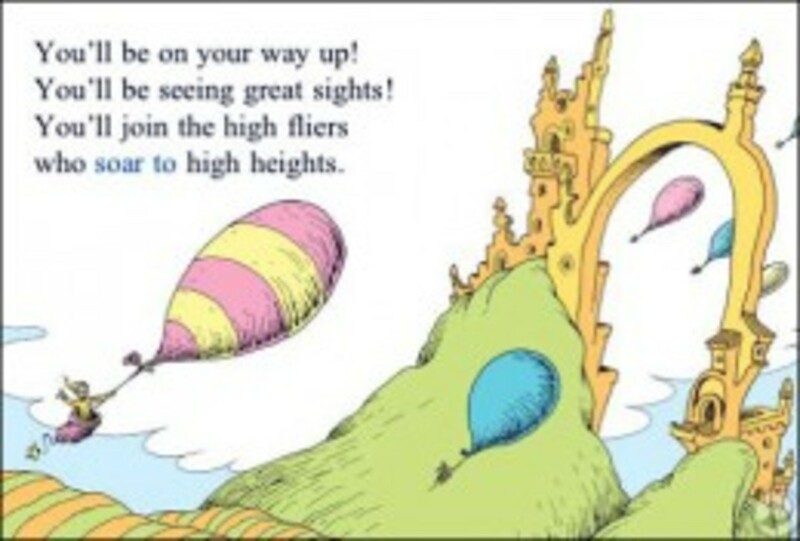 While most of us will not be writing for kids—but for adult readers—we can use some of Dr. Seuss' visual cues to improve our own documents. No matter what you are writing (an article, business letter, brochure, resume, ad, etc. 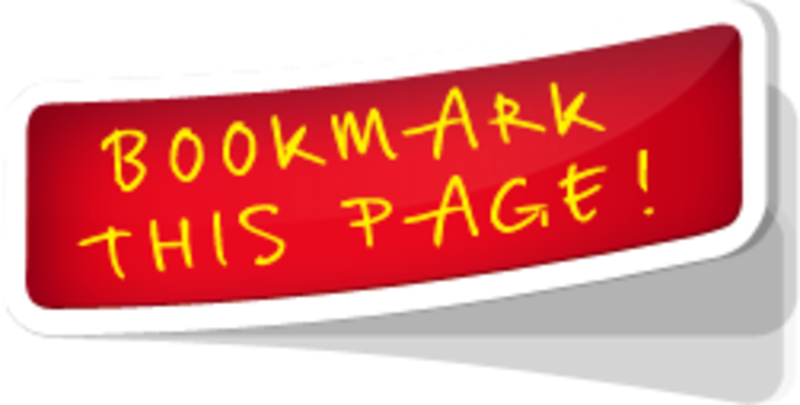 ), make your material look visually appealing to catch the reader's eye. Using plenty of white space creates a great first impression. Your goal is to make your information look easy to read. Also use 1-2 inch margins, generous spacing between sentences and paragraphs, and add other areas of white space around illustrations and graphs so readers don't feel overwhelmed and overloaded with information. Creating a clean, unobtrusive layout instantly convinces readers that they won't struggle through your information, and it creates a clear and visible direction for the eye to follow through to the next paragraph or page. 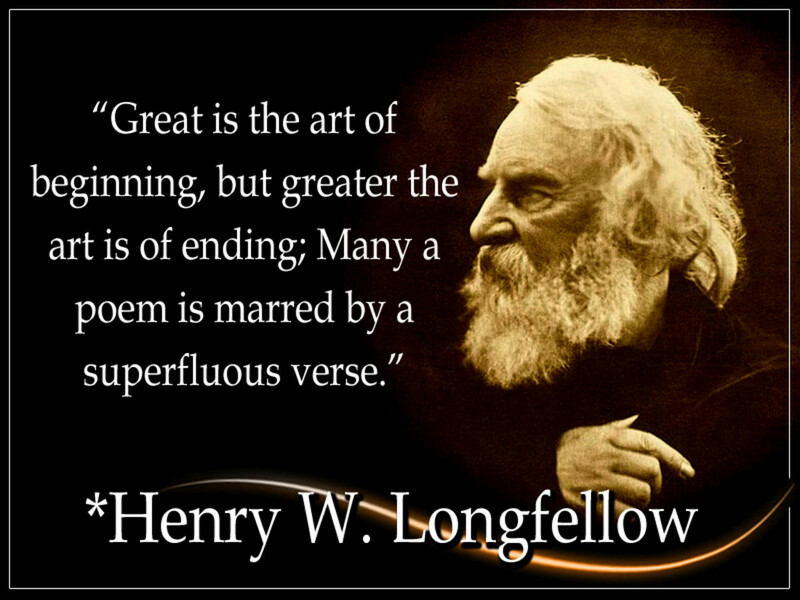 Henry W. Longfellow was an 18th century American poet and lecturer who is best known for his book, "Paul Revere's Ride." He became the most famous American poet of his day. Rule # 24: Don't Ramble On...End the Ending! Once you determine that you have finished writing your document, you must end it. Do not write a single word more. Many unskilled writers ramble on for another page or so, padding paragraphs with useless and unnecessary information. When you come to the end, you must end it. You will not sound more intelligent or educated by elaborating on points that you've already discussed. Don't waste your readers' time. End the ending. 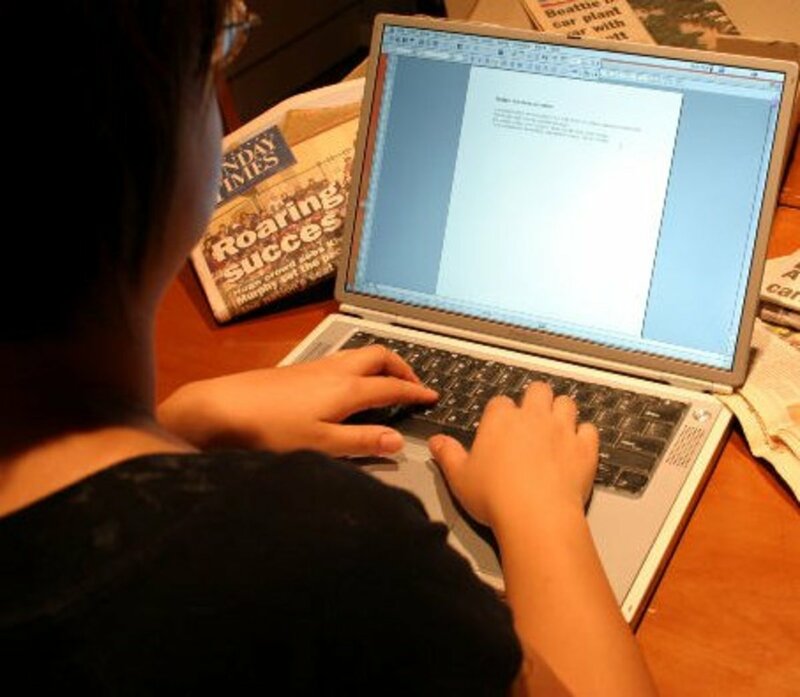 LousyWriter.com - learn how to write better, plus download free ebooks on plain English writing. Creative Genius - my blog where I share more advice on writing. Excellent tips! Voted up and shared. Great hub and great advice! I love how you've used quotes from famous writers to emphasize each of your points. As an attorney and having spent many years writing legal documents, I find it difficult not to slip into legalese. But henceforth, I shall follow your good advice. : ) Voted up and sharing!